The ROHO® Mattress Overlay System Enclosure Cover is water-resistant, flame-retardant, anti-microbial fabric. Offers moisture vapor permeability and can be easily cleaned and/or disinfected. Cover includes a double pull zipper to allow the caregiver easy access to the overlay. 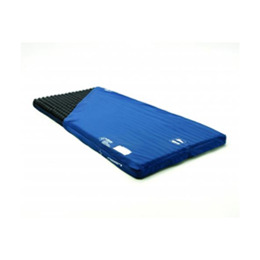 This cover consists of two pieces - top and bottom which zip together - to allow for the removal of the top portion for ease of cleaning if needed without removing the entire product from the bed mattress. Attached straps allow the cover to be secured to a standard single bed mattress. Carrying handles allow for ease of transport of product.